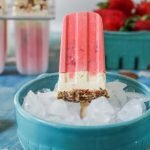 Just in time for hot summer weather, try these low carb strawberry pretzel-less pops. Imagine strawberry jello, creamy cheesecake and a gluten free crust wrapped up in a popsicle form. Your favorite summer dessert on a stick and it's only 3.6g net carbs per pop. Add 2 boxes of strawberry gelatin to a blender along with 1 cup of boiling water. Blend on lowest setting until gelatin is dissolved. Then add 2 cups of heavy cream and blend on high for a 30 seconds. Spoon into 12 popsicle molds and add the diced strawberries evenly into the popsicle molds. This should fill the molds only 1/2 to 3/4th of the way. Freeze for 5 minutes. Meanwhile add butter and pecans to a skillet and toast for a few minutes. Sprinkle salt, mix and set aside to cool. Next add the pudding mix and 1 cup of heavy cream into the bowl of a mixer and whip until fluffy. Spoon pudding mixture over top the strawberry pops making sure the pudding goes all the way down to the strawberry part. This can be a bit tricky because the pudding mixture is thick. Sprinkle nuts after the pudding and then add your popsicle sticks. Freeze for 2 hours.